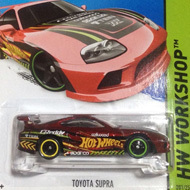 229/250 is part of the HW Workshop series and the 2015 Super Treasure Hunt set. The race car has blue Spectraflame paint with “426 C.I.” on the hood and “33” on the roof; both graphics are red with a white outline. 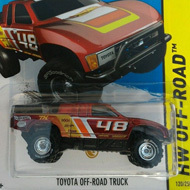 The sides have red & white graphics of “33”, “T-HUNT Racing”, “TH”, and a variety of logos. It has clear windows, a black interior, Deep Dish Real Rider wheels with red rims, and a chrome Malaysia base. The Superbird made its debut in the 2006 First Editions series. It is based upon the actual vehicle which is a modified Plymouth Road Runner that was designed for racing and only produced for one year.